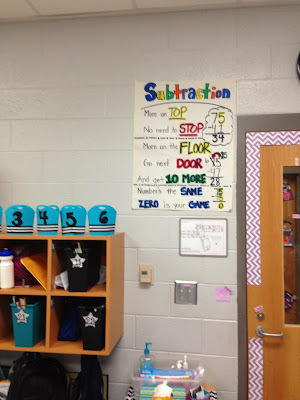 Blog Hoppin': Two Digit Subtraction with a Freebie! Two Digit Subtraction with a Freebie! Hi friends! It's Katie from Queen of the First Grade Jungle! I am just dropping in to share a little bit about what is going on in my 2nd grade classroom. I put it right next to our door so that when we leave the room for specials, lunch, recess, etc that the students see the anchor chart over and over. We also say it as a class as it has a nice sing-songy tune to it! 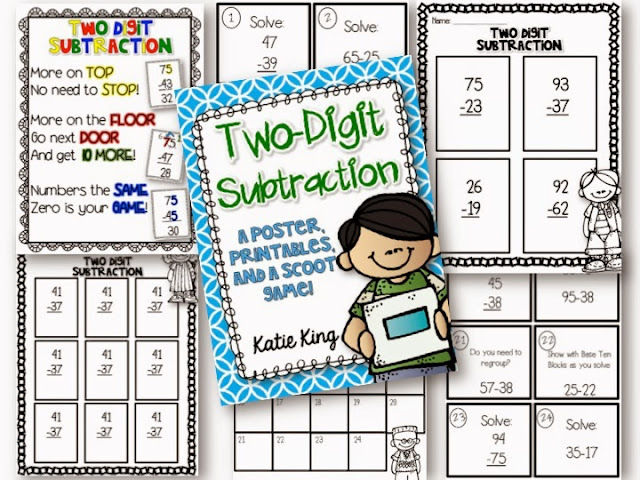 I need a few more days with this topic before I assess my kids (because subtraction with regrouping is HARD stuff) so I put together this little packet for you too! I made a digital copy of the poster because my teammates claim to be "anchor chart challenged". We have a super cool poster maker at our school so we blew up the small poster into big anchor charts for their rooms! You can snag this freebie pack by clicking on the picture below and heading to my TPT store! There is so much to pack into our "relaxing" Sundays, so I am hitting the ground running today! Enjoy your Sunday friends! You are so far ahead of me! Our curriculum is all wonky! Can't wait to use this one day! I love this packet and your anchor charts! Thanks so much for sharing! You are much further along than my firsties!! Perfect addition to my math workshop! Thanks! It's Black Friday at Blog Hoppin' too!